Leto hitchhiked in the cold rain and rode a crowded long-haul Greyhound bus as he promoted his rock band’s fifth studio album, “America,” which was released last week on Interscope Records, a label of Vivendi SA’s Universal Music Group. Leto said his journey taught him that despite the current political polarization of the United States, he found a sense of shared purpose among Americans. The actor, who won an Oscar for his role as an HIV-positive transgender woman in 2013 drama “Dallas Buyers Club,” is also directing a documentary, “A Day in the Life of America,” in which he explores the lives of different Americans on U.S. Independence Day, July 4, 2017. It was not Leto’s first trip across the United States. 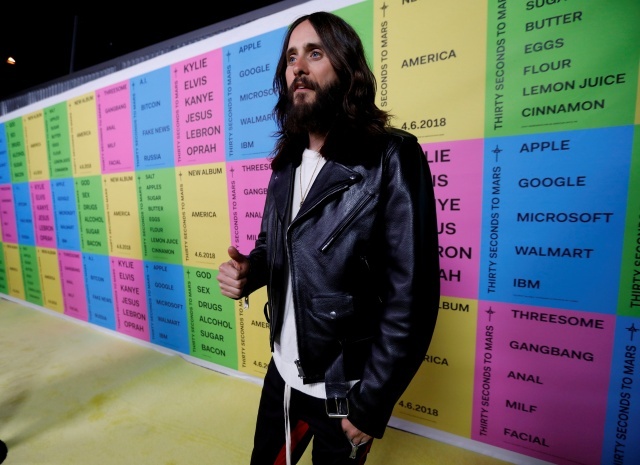 “I had done it when I was a kid as an art school dropout and I headed to L.A. to become a director,” said Leto, who caught his first big break in Hollywood on the mid-1990s cult teen TV drama “My So-Called Life” as a moody high school heartthrob. “I had a backpack on and a couple of hundred bucks and it changed my life, so it was fun to go back and take that journey again,” he said.